I did this last night and it set me thinking about what it is we try to do when we make a painting or drawing. What are we aiming for? How do we choose what to depict? What are we trying to “say”, if anything? I was walking the dogs past a little stream we like, between Ambleside and St Johns in the Vale. The stepping stones were in shadow and further up, some of the stream was in sunlight. I do like that change from cool blues to hot pale golds that you get on Autumn sunny days. Took a photograph to work from, as I also enjoy the way digital cameras can pick up and make sense of these lights and subtle colours. I chose pastels for this as I like the immediate colour. No mixing! It’s trying to think through – what I’m thinking through – as I draw/ paint. I guess I was thinking about the lines of sight (where I might want a viewer to travel with their eyes) and also the areas of light and shade as part of the composition. 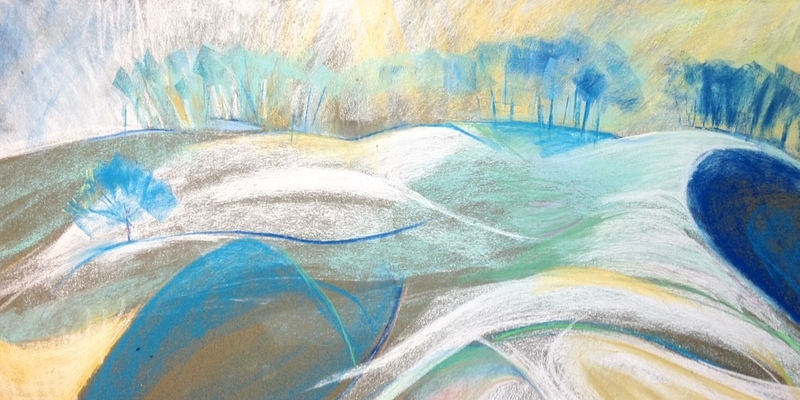 I wanted to communicate that change from pale green golds to cool blues and shadowed water. I was also interested in the sharp sunlight in the distance and the tumbling energy of the water in front of the stepping stones. However, I don’t feel I have the “control” that others do when it comes to making pictures and certainly I have to think “cool/ warm” and “lighter than / darker than“, when I am working. It’s also about play. Trying NOT too hard. Keeping playful. Probably one of the hardest things. Once I “try” (to do as others do) then the picture becomes stilted and cold. The most fun though with chalk pastel drawings (I’m not a fan of calling them paintings, they’re dry for goodness sake!!!) is using them on their side. On their ends they look like wax crayon drawings – on their sides they make sweeps of colour that do all the work for you. Copyright © 2019 Alex Jakob-Whitworth. All Rights Reserved. The Matheson Theme by bavotasan.com.